Florida House Speaker Richard Corcoran has been running a quasi-campaign for months, but ultimately he lacked funds and popular support. Wednesday marked the end of Florida House Speaker Richard Corcoran's long-awaited campaign for governor. It was all but announced, with millions spent on a bombastic TV ad, a political committee created, internal polls conducted. 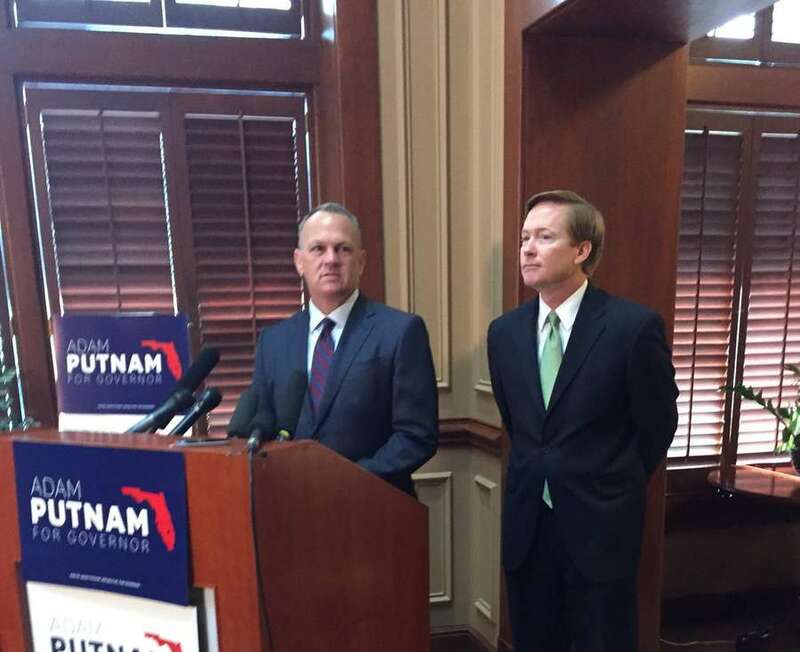 At a morning press conference in Tallahassee, Corcoran endorsed Florida Commissioner of Agriculture Adam Putnam. 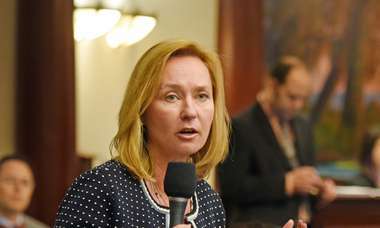 Putnam, an establishment Republican, is now locked in a two-man primary race against U.S. Rep. Ron DeSantis, a favorite of Fox News hosts who was endorsed by President Trump. Corcoran told reporters Wednesday that he re-evaluated and realized he did not "have the resources to win," adding that "it's important we rally around the right person to lead this state." That person, Corcoran said, was Putnam, whom he called "authentic." He said their children are friends and they have known each other a long time. Corcoran said it took "all of 2.2 seconds to endorse Putnam" once he realized he was out of the race, adding that he was a "phenomenal leader." The two embraced in a hug after Corcoran formally delivered his endorsement. That's a change in tone from the outgoing speaker, who in the past blasted Putnam for supporting "amnesty" for undocumented immigrants. RELATED COVERAGE: Richard Corcoran's explosive ad warns anyone can get killed by undocumented immigrants. Adam Putnam's momentum stalls in bid for governor and he sees trouble — on Fox News. Ron DeSantis: Adam Putnam was a politician in his 20s, I was serving in Iraq. Corcoran's sudden support of Putnam didn't escape notice of the Florida Democratic Party. Within moments of the announcement, the Democrats sent out a blast email noting all of the differences between the two. "The differences between Richard Corcoran and Adam Putnam don't stop at immigration," said an email from Kevin Donohoe of the Florida Democratic Party. "Putnam was a critic of Corcoran's education policies and spoke out repeatedly against the gun legislation Corcoran pushed through the Legislature this year." Corcoran, who is from Land O' Lakes, unsuccessfully tried to seize on immigration as the topic for his only political TV ad, which depicted a white teenage girl being shot point-blank in a suburban neighborhood by a hooded "illegal immigrant." He even held a debate one-on-one with Tallahassee Mayor Andrew Gillum, whom Corcoran has accused of running a "sanctuary city" and who is running as a Democrat for governor. But the ad, which burned through much of his campaign cash, didn't move the needle much on Corcoran's low name recognition, according to polls. And lately his campaign had become quiet, prompting speculation in political circles he could be running for attorney general instead. At the conferences Wednesday, Corcoran put those rumors to bed and explained what would become of the about $2.2 million he has left in Watchdog PAC, his political committee, saying the funds would go toward Putnam and legislative races. Corcoran, 53, was elected to the Florida House in 2010 and was speaker from 2016 to 2018. A true believer in conservative core principles, he has led major policy discussions on school choice, championing controversial mega education bills HB 7069 and HB 7055 two years in a row to expand voucher and scholarship programs, making him an enemy of teachers' unions and a hero for charter schools. He also was a loud voice against Medicaid expansion in 2015 as allowed under the Affordable Care Act. That year, the Senate included Medicaid expansion in the budget but the House blocked it, ultimately winning out in a special session stalemate. Corcoran's vowed to take on the "Gucci-loafing, shoe-wearing special interest powers" that he said had a stranglehold on the status quo. He pushed new House rules to require all special budget projects to be filed as standalone bills and mandated that lobbyists disclose which bills, amendments and appropriations they are trying to influence. Former legislators are also banned for six years from lobbying the House because of Corcoran, which was an extension of the two-year ban on the Legislature as a whole. 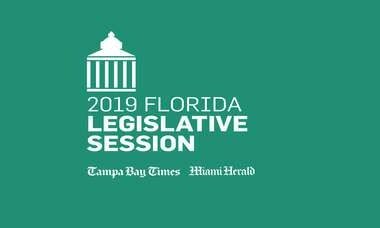 Yet for all of Corcoran's accomplishments as a skilled legislator who dominated the Republican agenda during his eight years in the Florida House, his appeal to the broader electorate was limited. Running in a conservative Land O'Lakes district where Republican voters outnumber Democrats by nearly two-to-one, Corcoran never had to run in a general election. In fact, only twice did he face voters at all, in 2010 when he won the GOP primary with the support of 5,319 voters, and in 2012, when he won re-election with 9,676 voting for him. He was unopposed in 2014 and 2016, meaning that in a state with more than 12 million registered voters, Corcoran was never elected to office with anything more than 0.08 percent of the Florida vote — a weak springboard to statewide office. That's not a sign of Corcoran's weakness, necessarily, but of questionable potency in being House Speaker. Marco Rubio, who served as House Speaker from 2006-2008, was the last to capitalize on it and attain higher office, and it took him the 2010 tea party wave to upset the unpopular Charlie Crist for U.S. Senate. Aside from being untested in a safe House district, Corcoran had failed in two previous bids for office: in 1998 for the Florida House and an abbreviated run for the Florida Senate in 2007 before he dropped out. There won't be any other run for office, Corcoran told reporters, ruling out a bid for Florida attorney general or being Putnam's running mate. He reminded them that he had earlier said that it was a case of "run for governor or go home."